Belgravia Fascinators are one of our most popular styles. They are made with dyed and natural feathers according to their colours and have a base of goose feathers with a beautiful display of stripped coque feathers which dance daintily. They are sewn on a see-through comb and can be worn either side of the head. The Belgravia is a reasonable sized fascinator without the flamboyance of The Mayfair. We love it and it comes in a stunning range of conventional, vivid and fluorescent colours. View the whole Belgravia range here. 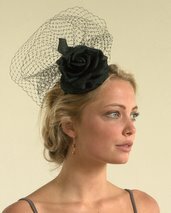 Our Kensington Fascinators are made with sinamay and netting rather than feathers. This is a delicate fascinator with a sinamay base topped with a beautiful fabric flower. The birdcage netting gives it grace and charm. This fascinator is fitted to the head with a head band and can be worn either way round. It is very comfortable to wear. The Kensington is a perfect bridal headpiece in white or ivory and also comes in a good range of colours. View the whole Kensington range here. 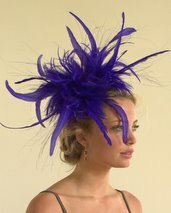 Our Mayfair Fascinators are our largest and most flamboyant wedding fascinators. They are made with hackle feathers and unstripped coque feathers with dyed burnt peacock. They are on a see-through comb and can be worn either side of the head. They have been seen at The Royal Wedding and are perfect for a bride. The Mayfair is a ‘substantial fascinator’. We love it and it comes in a huge range of conventional, vivid and fluorescent colours. View the whole Mayfair range here. Our Chelsea Fascinators are a wonderfully pretty style. They are made with goose feathers with both natural and dyed hackle feathers and a profusion of dyed burnt peacock. They are on a see-through comb and can be worn either side of the head. 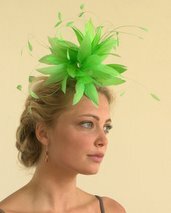 The Chelsea is a good sized fascinator, fuller than the Belgravia, but not as tall as the Mayfair. They come in a stunning range of conventional, vivid and fluorescent colours. 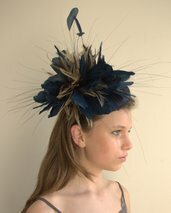 There are single coloured Chelsea fascinators and two-coloured ones with natural feathers. View the whole Chelsea range here. Our Fitzrovia Fascinators have a unique delicacy of design. They are made with dyed hackle feathers and have wonderful burnt curly pheasant motifs with a pretty display of stripped coque. They are sewn on a see-through comb and can be worn either side of the head. The Fitzrovia is a stunning delicate headpiece with real elegance. Like all of our styles, it comes in perfect bridal colours as well as a stunning range of colours. View the whole Fitzrovia range here. Our Knightsbridge Fascinators are a delicate and beautiful wedding fascinator. They have a base of goose feathers with fluffy ostrich and long strands of burnt peacock. They are on a see-through comb and can be worn either side of the head. They are perfect for a bride in cream or ivory. View the whole Knightsbridge range here. 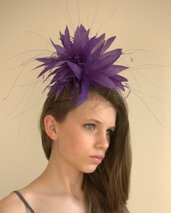 Our Royal Ascot Fascinators are designed for the famous race meeting especially with The Royal Enclosure in mind. These striking headpieces are all on sinamay bases that measure 18cm plus to comply with the Royal Ascot Enclosure dress regulations. They are secured onto the head with a double headband and are comfy and easy to wear. View the Royal Ascot range here, but do not hesitate to contact us about bespoke fascinators and headpieces for this special event. Most of our Royal Ascot headpieces are special commissions so please get in touch if you would like that very special piece made.